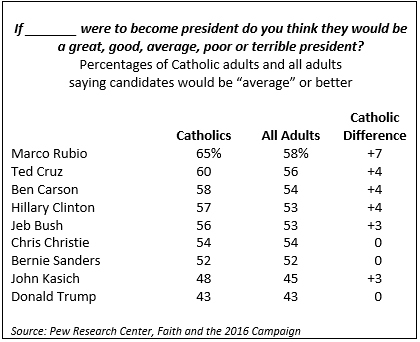 We have our first view of what Catholics think about the candidates running for president in 2016. The Pew Research Center conducted a survey of U.S. adults in mid-January and asked, if elected, how great or terrible each of the candidates would be as president. Six in ten or more Catholics think Marco Rubio (65%) and Ted Cruz (60%) would be an “average” or better president. Donald Trump trails the field with just 43% of Catholics thinking he’d be “average” or better. A majority believe Hillary Clinton (57%) would be “average” or better. In general, Catholics are slightly more positive about the presidential prospects in the field than the public overall. The “average” or better calculation provides inferences to which candidates Catholics might be willing to vote for rather than a positive affirmation of a candidate. The next table looks at overall positive evaluations, negative evaluations, and net positives. Hillary Clinton strongly leads the field with 40% of Catholics saying she would be a “good” or “great” president. However, about the same share (41%) thinks she’d be a “poor” or “terrible” president. 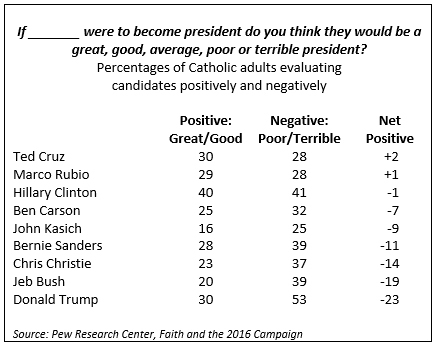 Ted Cruz and Marco Rubio have fewer Catholics thinking they’d be a “good” or “great” president but their negatives come in a bit lower as well. Significantly fewer Catholics think they’d be a “poor” or “terrible” president (28% each). It is still extraordinarily early. The outcomes of primaries and continued debates and advertising will undoubtedly shift opinion. As a sheer votes contest today, Hillary Clinton would likely win more votes of Catholics than any other candidate. But Clinton, along with Donald Trump, are “well knowns” and each already has sizeable opposition. As Catholics get to know the other candidates they have room to grow their positives and negatives. Most have more “room to grow” (or fall!) than Clinton or Trump. Images courtesy of Gage Skidmore. With the new year, Election 2016 gets serious. 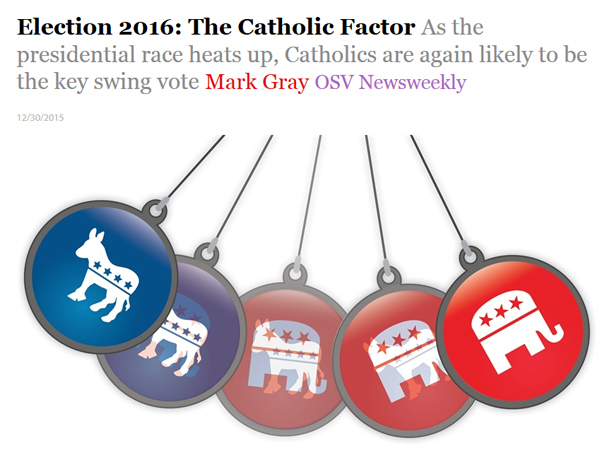 As we did in 2012, we will again be tracking the Catholic vote all year long. As I've often said this is by no means a "voting bloc" but that is why it is so important. By religion, it is the only group of voters that can go Republican in one cycle and Democrat in the next. Those of other religious affiliations are much more consistent voting for one party's candidates over time. Catholics are the ultimate "swing vote" that candidates typically need to win the presidency. Rather than kicking off our election coverage here this year, we were thrilled to have it published in OSV Newsweekly. Check out the story here and stay tuned to the blog for more election analysis this year.